I grew up washing my hands in the kitchen sink when I came in from outdoors and often before meals. Mostly because it was the most convenient one, and for that matter, really the only one, unless you wanted to walk to one of the bathrooms in the back of the house. I just spent some time visiting with Mark Curtis in the Amish community at Belle Center, Ohio. Mark made the observation that Amish don’t wash their hands in the kitchen sink, and that a second sink is pretty common in every Amish home. 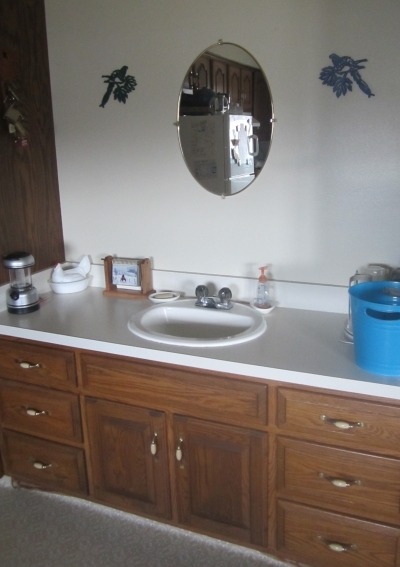 Sure enough, as I mentally reviewed the Amish homes I am most familiar with, pretty much every one had an auxiliary sink for scrubbing up (the only one I could think of that didn’t was a dawdihaus). Usually they’ll be attached to the kitchen or in or near a mud room. Mark let me take a photo this morning of his second sink–there is probably a name for this, but I’ll call it that for now–which in Mark’s home is located right in the kitchen. Ever used one of these? I had never heard of this before, but I sure could have used one when my children were growing up! All of the true Amish homes I have been in have these second sinks. The English converted homes have not. It truly makes a lot of sense as the sink is so often in use and do you really want dirty hands being washed in the kitchen sink? I think it is brilliant. Actually a couple of the homes this second sink has been child sized in that the counter is the perfect height for children. At one such house the 4 yr old girl was scrubbing vegetables and that is also where she will fill the basin and do dishes! Hadn’t ever really thought about it, but doing a little mental review of the Amish homes I’ve visited, you’re right! I’ll pay more attention to this little phenomenon. I remember growing up we used to air dry our dishes rather than dry them with a cloth. My dad would come in to wash up and get soapy water on the clean dishes so they had to get washed again. A second sink would have solved that problem. very useful and practical. in a way, it reminds me of the “Pittsburgh toilet,” which is usually accompanied by a sink. Thanks for sharing this picture, Erik! I have only been in one Amish home. Aside from noticing the beautiful wood floors and kitchen cabinets, I was preoccupied with keeping my toddler away from the hot oven! It’s great to get an inside glimpse of Mark’s home. Even though I don’t know him, it’s nice to have his input on different subjects through Don. Enjoy your stay! Erin you make an interesting side point here. The things Amish children may be trained to avoid are things visiting English kids may not be familiar with. This brings to mind the comments that were made on the recent PA German post about the Amish kids in the welding shop not looking at the light. Incidentally I was in a very large Amish manufacturing operation Monday where 3 welders were working simultaneously. I happened to look right at the weld flash as we were walking by…felt fine but out of curiosity asked my “tour guide” how dangerous that is. He said you’d have to look at it for an extended period for your vision to be affected (he was talking about minutes). I was surprised as I thought it was shorter but that is probably just me being English. The masks they wear are designed to darken on the flash. Very true, Erik! It reminded me of another story on that same journey. I was visiting with an Amish man that builds cabins with this sons and we were talking outside in his driveway when one of his older sons came home with the team of horses. The son (looked to be about 12-14 years old) that was visiting with me immediately left the conversation to help unhitch the team. I didn’t even notice a gesture from the father. He just knew it was expected of him. I would love to instill some of these hard work ethics in my own children. We have a mud room/laundry room with a porcelain sink with a drain board. Originally the sink was part of a metal cabinet. We installed it with a wooden cabinet(the metal was pretty well rusted out). It is wonderful for washing dirty hands and we have a stool for grandchildren to use when they come in. With the drain board, it is great for washing fruits and vegetables. Additionally I wash other dirty things and soak laundry. Love that extra sink. Leave the clever (and practical) solutions to the blessed Amish! Growing up, Mom didn’t allow us to wash our hands at the kitchen sink and if we tried, she’d fuss and to the bathroom we were sent! My husband wasn’t raised that way, so gets annoyed with me when I shoo him away from ‘my’ kitchen sink to go wash up in the bathroom! Thanks for sharing the everyday things with your readers. I so enjoy it! Glad you like it Jan. And good for you for defending your turf. I love that idea. We had a side bathroom just next to the back door on the service porch. It had a sink and a toilet. We washed our hands there. I was surprised to see the mirror. I didn’t think they used mirrors that large. Every Amish home I have been in has a mirror. Most are NOT in the washroom but at this second sink out in the wide open of the home. The one’s that do not have a rather large hand held one they use. Even my very good friend that is Dan Gmay Amish have a mirror at the second sink but no where else in the house! We have a second sink right inside the entry from the back door. I think it’s rather common in farmhouses as you don’t want the muck & mud ( & other stuff) near food that people commonly have on them! Thanks Renata! Sounds like you have a Polish name. Growing up we had a sink near the back door entrance for washing up. My mother was rather picky about the kitchen sink and would have a near-fit if any of us children dried our hands on her “dish towel.” Brings back fond memories, for sure. The Swartzentruber homes I have been in have kitchen sinks, but no running water. They bring water to the kitchen sink for washing and rinsing dishes. They do have back sinks with hand pumps (still, no running water). 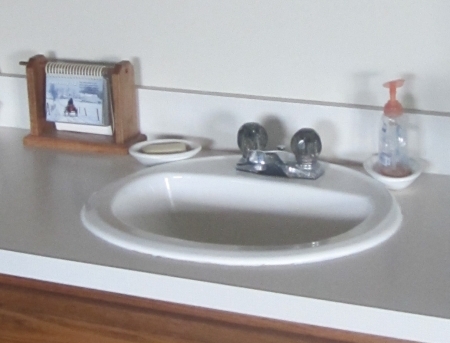 Our Amish friends have “second sinks” at their entrances. Except, the dawdihaus. You are right about that exception. Probably because the grandparents aren’t the ones doing the really dirty chores! :-). I think it would be a great idea for any house!!!!! With the dawdihaus I thought that might be the case Theresa but didn’t dig into it…it makes a lot of sense to have one if you have half a dozen guys coming in to eat, crowding around a kitchen sink is basically impossible, especially if it is involved in the food prep process. Standard feature. Our home was built in 1918; so it is closing in on 100 years old. Not sure if we will still own it at that time or not. At any rate, it was built as almost all homes at that time were built; (locally anyway) on a pier and beam foundation. When we bought it in 1985 and I was doing the cleanup I found a good 60 years worth of junk thrown up under there for “storage”. Most should have gone straight to the dump to start with. One useful thing I did find was an old high back porcelain coated cast iron kitchen sink. I took it to a recoating place and had it completely stripped down and recoated. We hung in the back entry room that we added to the house and which we call a mud room. Ninety percent of the time that is where I wash my hands and arms when I have been out working in the yard or in the garage. When we still had kids at home it was great, because we could clean them up before they got into the rest of the house. We got the idea from our former neighbors where we used to live before. They were not plain, but they did have about a half dozen or so kids. It worked well for them, it has worked well for us and when we build our retirement home it will have a sink just like it in the mud room. My parents, of course, had o ne in the kitchen and on in the garage. Mom used it if she needed to rise something before putting it in the washer, but it really was put in for us to use before going in the house. We use to wash our hands there or get the mud off our shoes, etc. MJ this is quite common. More conservative homes will be plainer. But mirrors, second sink not unusual for most Amish. What books have you read about the Amish? I’ve been reading through so many posts here, and adding to my knowledge of Amish culture and life styles. I have had an abiding interest in Anabaptist culture and history since my early teens, when my mom found a source of pure, natural beehive honey with honeycomb still in it from a fairly conservative Mennonite family living in a huge house with eight kids up on the slightly northern Peninsula area of Tidewater, Virginia. The mother and four daughters wore long print dresses, their hair pinned up and little Mennonite style coverings, but the mom wore a watch, and a very narrow, plain gold wedding ring, which sort of intrigued me, since I had always thought those things weren’t allowed to “plain” folk. The fact that I still recall it at 60 probably means it made quite an impression on me! I am wondering if perhaps the big pretty mirror at the “second sink” in a public area like the kitchen, but perhaps not always in a bathroom, where a door which could be closed to provide bathing privacy, would be to keep from its users yielding to temptation and developing a sense of pride of self, or losing humility? I mean, you would not be tempted to stand admiring yourself, if the mirror were out where it, and anyone using it, could be observed easily by other family members, especially your siblings who would surely tease you unmercifully, as siblings are wont to do in any family, if you were observed admiring your countenance in the mirror! And I have seen some stunningly beautiful Amish girls in the community of Amish I have visited with my husband South and East of Indianapolis, IN. There was a fundraising dinner held in an Amish home there years ago to raise money to help an Amish family with some extremely high hospital bills resulting from a father’s fall accident from the top of his barn. He survived, but had been in the hospital for weeks and weeks, and had several surgeries, still facing a long recuperative process. It was an amazing opportunity to not only help out another man’s family, regardless of his religion, but to be welcomed into an Amish home and sample a meal of wonderful homemade food. It was a very well organized meal of course, since that is not something they are unfamiliar with! When we were leaving, we walked by a group of young women, and one turned around to step aside out of our way, and she was stunning! Even with a full mouth of braces, surely as lovely as any other young woman of any group I had ever been around. Mark & Don, I am totally impressed with this area of Mark’s home. It is so nice & neat. I’m also drooling over the 3-drawer base on either side of the sink area as I love anything with storage. Mark let me take a few other photos so may have something more to share 🙂 It was a very nice visit with Mark and also got to say hello to Don and Fritzi the dog before I had to leave. Hi Erik, I am so glad you were able to visit Mark and see his home. Don and I have been in touch and given our boys the others address. I hope they are able to connect. Seeing an indoor sink which I assume has running water, reminded me again of Ed’s hard situation. He and Ruth have a kitchen sink which is not plumbed. They pump water outside, heat it on the wood stove, and then use the sink area for all cleaning. They have to then haul the used water back outside, as they still have no drains. When we visited last fall the temps were mild, but I can’t imagine how hard this is this time of year. Also, I believe they got record snowfall last weekend. Brrr! Anne this very conservative arrangement would seem particularly hard to get used to for someone who grew up English…this tells me Ed must have a pretty strong conviction. Have you heard from Ed and Ruth recently, Anne? I was thinking of them this past weekend when we had record snowfalls. We had 7.5 inches in Central MN so I imagine they got even more further north. We’re due for more later this evening as well. I shoveled for 30 minutes on Monday morning when I became exhausted and asked my husband to use the snowblower at the end of the driveway. It was really dense! With their lame horse, I imagine they had to shovel themselves or perhaps a neighbor helped them. We have had water and/or plumbing issues a few times over the last few years and I always think it’s the end of the world having to carry in buckets of water. Really puts your son’s life in to perspective. Hi Erin, and yes! We just got a letter! Ed updated a couple if things. I’m going to send the news to Erik as he may want to use it. I really appreciate your asking and think all of you are so supportive. Thanks! That’s great Anne! Hopefully things are looking up for them. First, our rather large sink had a basin sitting under a hand pump. Warm water needed to be carried from the kitchen stove. You dump the basin when you are washed. Second, no exposed mirrors. Any such mirror would have to be covered by a small curtain, or installed inside a medicine cabinet door. Kitchen sinks were of course a dry sink. Of course we knew other Amish had such conveniences, but we suspected they were straying. Sounds very traditional Eli. Curious, did you even think of the ones with mirrors and running water as “real Amish” at the time? I personally considered them as Amish, but others called them “fine” or “half Amish” as opposed to plain. But then I was only a teenager. It was good to see you, again, Erik. Actually, Fritzi thinks you came to see him. Fritzi thinks he’s so special that everybody should come to see him. Glad you got to spend some time with Mark. He said that you were invited out for supper to another Amish home and got to go with him with the horse and buggy. How was that experience? Mark does try to keep his house neat and clean. But, once a year the women of the church all come together at his house and spring house clean it. They say that women can always find something to clean in a bachelor’s house. Mark says that they find places to clean that he never even thought about cleaning. Like the little shelf on each side of the bed that the bed slats rest on. I know I’d never think of cleaning there either. Don it was great to see you and Fritzi too. I was well fed at the Schlabachs home that night. The buggy ride was great, I have a couple of photos of Mark’s buggy I will share later. Also I have to tell Mark he is pretty smart to outsource his spring cleaning! I thought you might like to know about the cut-outs of the parrots on either side of the mirror. One of the Amish boys made those for Mark. He scroll-sawed them. One is painted blue and the other green. They are supposed to represent Mark’s two Pacific Parrotlets (Pepe and Pepita.) Pepe is blue and Pepita is green. He’s had them about ten years. They were supposed to be male and female but all indications are is that they are both male. Anyway, the Amish boys are fascinated when the come over to Mark’s house and spend the night like they often do. Pepe and Pepita get let out and often join everybody for breakfast. One of the favorite things they do is to steal cereal out of Mark’s bowl or any other bowl that they can get away with. They like to ride around on Mark’s shoulders or perch on the curtain rods. They are about the side of parakeets but are not parakeets. They are the smallest breed of true parrot. They don’t have the long tails that parakeets do. Mark will often take them out on his screened in porch in the summer. They love to fly around and climb the porch chains. Mark keeps the screen door locked because his barn cats sit around outide the porch with hungry look in their eyes.